"Asparagus, Cheddar cheese, and slivered almonds combine to create a very elegant side dish for Thanksgiving!" Preheat an oven to 350 degrees F (175 degrees C). Grease a 8x8 inch baking dish. Melt the butter in a saucepan over medium-low heat. Whisk in the flour, and stir until the mixture becomes paste-like and light golden brown, about 5 minutes. Gradually whisk the milk into the flour mixture, and bring to a simmer over medium heat. Cook and stir until the mixture is thick and smooth, 10 to 15 minutes. Remove from the heat, and whisk in the Cheddar cheese until melted. Season with salt and pepper. Line the prepared baking dish with half of the asparagus spears. 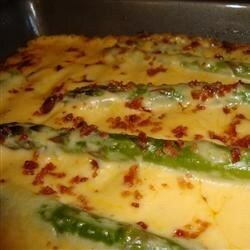 Pour in half of the cheese sauce, top with the remaining asparagus spears, then pour on the remaining sauce. Sprinkle with the slivered almonds. Bake in the preheated oven until the asparagus is hot and the sauce is golden brown on top, about 20 minutes. The ultimate Thanksgiving leftovers hot dish! Just a so-so side dish for us. Couldn’t ever get anyone to eat up the leftovers. Wouldn’t make it again, just because it wasn’t fantastic. Disgusting. I really had high hopes. I used extra cheese because I love cheese but it didn't help. The sauce it's awful and the use of canned asparagus was awful.